Socio-economic empowerment, adult literacy, and improved disaster resilience are helping disaster-affected communities in Thatta reduce poverty, hunger, and gender inequality. 60 women from four villages completed an adult literacy course from Adult Literacy Center in Jaffar Mallah Village. With assistance from a freelance designer, 60 women received product development training at the vocational center. These women acquired product development training in appliqué and embroidery skills and prepared a range of marketable products. .
During exposure visits to Karachi, production supervisors and sales market agents held meeting with potential buyers for income generation. Several orders for laces, buttons, bags, bed sheets, appliqué work and other products were completed and generated an income of more than Rs 60,000 (USD 600). An opportunity was provided by Community World Service Asia for women to participate in a festival and set up a stall of their products. 19 women and 6 men were trained to conduct sexual and reproductive health (SRH) sessions for the community with co-facilitation from project staff. 3,828 community members (995 men and 2,833 women) participated in 97 SRH sessions. 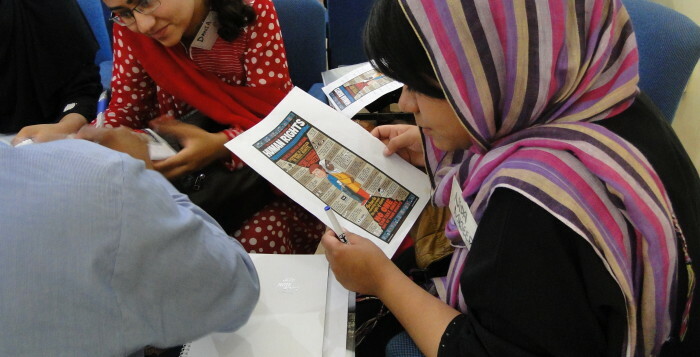 252 women, 248 men, and 358 school children participated in disaster risk reduction training. With assistance from Community World Service Asia project staff, Samani Mallah, President of VO Jaffer Mallah organized an evacuation drill for women and children as preparedness measures for predicted floods in 2014. Additionally Mother and Neonatal Child Health (MNCH) week was organized inBijora in close coordination with Thatta’s health department. MNCH activities included a free mobile health camp day, a day training for traditional birth attendants (TBAs), and tetanus toxide (TT) vaccination campaign for women. A rally was also organized to create health awareness in the community. All project components are integrated to enhance the capacity of vulnerable communities toward sustainable development. Community organizations (CO) and village organizations (VO) were mobilized and trained so that they could successfully lead their communities on a sustainable journey toward resilience. According to the statistics there is a lot of youth in Pakistan so they have the power to change the nation. I have learned about the actual meaning of democracy and also learned what should be my behavior as a good citizen.